During his drawing phase, Zhang Liao can draw X fewer cards. He then chooses X players that have the same amount of hand cards or more as himself. Zhang Liao takes a hand card from each of these players. 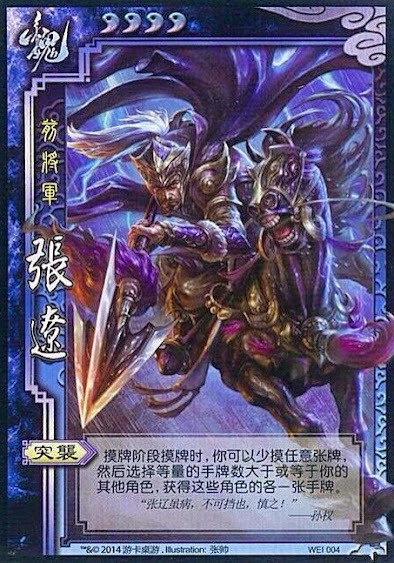 Zhang Liao can now mix using "Raid" with drawing from the deck. He can draw two (like anyone), take two cards (like before), or draw one card and take one card. The new limitation means that Zhang Liao cannot target players with "Raid" that have fewer hand cards than he does before he draws anything. The counting is done before Zhang Liao draws, so he could end up with more cards than someone after using "Raid". Zhang Liao cannot take two cards from the same person via "Raid." Only hand cards can be taken by "Raid." Equipment and pending cards cannot be removed.